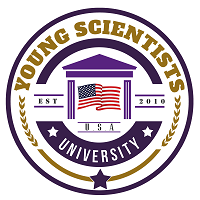 Young Scientist University (YSU) is a Global consortium of scholars from all over the world networking together for conducting research into contemporary issues collaborating with many renowned Universities and Research Centres. It has been legally incorporated under the laws of USA by a group of highly qualified academics and professionals worldwide to train and mentor young specialists in spheres relevant for the sustainable development of the global village. YSU is a leading & one of the fastest growing research-oriented Institutions affiliated with Hebron Eco University & in working partnership with various Institutions of high repute in scientific research. Young Scientists’ University, YSU is an Institution with a rich heritage in academia and a global reputation for research led innovations. It offers off-campus based platform primarily into Doctoral & Post-Doctoral research programs in a flexible and collaborative learning environment, through extensive research and industry coalition, enabling working professionals to enrich their skills, enhance their career prospects and make a real difference to the wider world without much disturbing their professional routine. In today’s cyberspace revolution we can no longer afford to be ordinary pieces. Each one of us has to be an extraordinary masterpiece and attest ourselves at every second of life. To get that extra-ordinary upshot in your life, you need to polish those ordinary skills and outshine yourself for the world with YSU. This knowledge comes to you at your own need, your own time, your own convenience and your own pace and all this with that touch of traditional teaching methodologies. YSU caters to building strong blocks of skills and knowledge for people who want to get that added advantage and stay at the forefront of world-class competition. Our goal is to enhance people’s skills and let them envisage themselves to be geared up for today, tomorrow and forever.